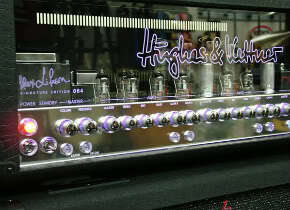 Hughes and Kettner – With its depraved infernal glow of eight blazing red-hot tubes says it all; Hughes and Kettner Warp X is amongst the undisputed heavyweight champions of the Nu Metal arena. Look no further for brutal riffing power. The amp boasts a Clean channel with bold, big and crisp tones and a brilliant “Warp” channel to put a smirk on the face of any metal riff-monster. Warp X’s distinctive name accurately describes the amplifiers’ massive tone and thick sound forced pumped from it’s powerful 120-watt, 6L6 tube-driven-power amp. The Warp X was clearly designed to produce pure dark energy. In addition to the aforementioned wealth of features, the Warp X employs a top-notch Clean channel tweaked specifically for thick tones and a Warp channel that brings new meaning to the term “warped,” Warp X offers a ferocious wide-range of features that you won’t find on any other amp. Check out the Lube button, a sonic lubricant for fluid leads and riffs. Press it to alter the dynamics of the amp’s distortion. Wait!, There’s more: Warp X sports Effects Loop Assign, a remarkable FX management tool for allocating external devices to one or both channels on the amp. For example, stomp on a single switch to go from the clean with chorus, delay to its illustrious Warp sounds without any effects getting in the way of your sonic assault. Adding the optional MSM-1 MIDI Module will give you even more flexibility. 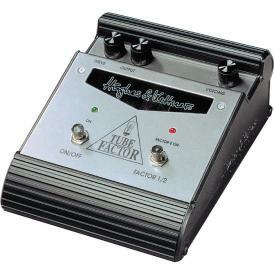 The MSMS-1 allows you to sync up your amp and external effect devices and switch them simultaneously via a separate MIDI pedal. Gear up for the 21st Century, rockers – Get Warped!